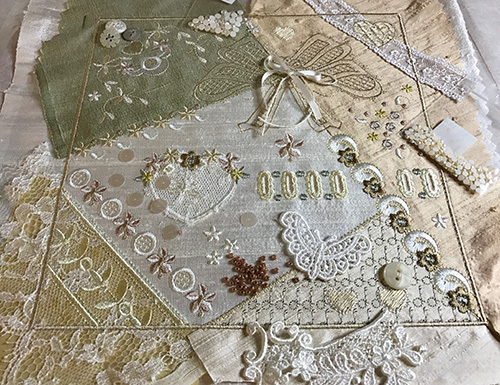 Included in the block is a small dragonfly which can be stitched at the end of the embroidery process, eliminated to allow you to use a lace motif, or it can be stitched out seperately on tulle so it can be decorated and added later on so it looks as though it is in flight. 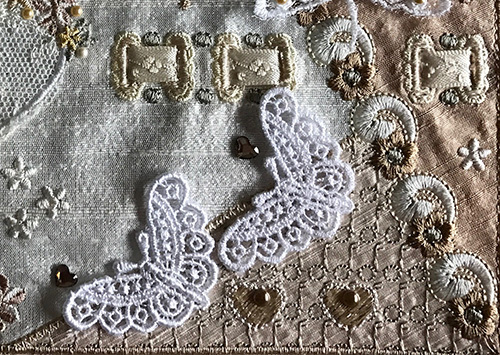 I made the mistake of stitching my dragonfly in ivory which is too stark, thinking it would match the lace I had added. However upon reflection I think he should have been stitched in the colours I had orginally selected for him. I like the way the body looks and find that cutting around the embroidery just under a ¼” prevents the stitching from being cut, and hardly shows after washing out the stabiliser. Try staining white lace with tea or coffee for a more antique look. 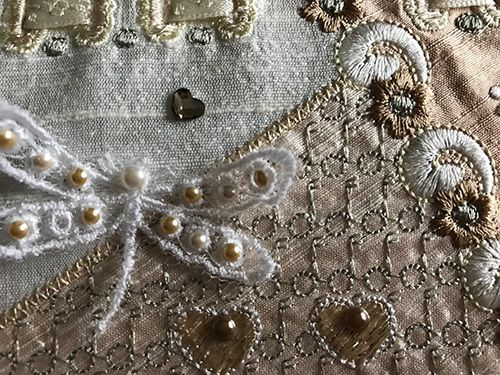 I embellished the top of the lace applique heart quite heavily with severals colours of pearls. I adore Venise lace and have found that it can be split quite succesfully. If you are worried about fraying a spot of fray check will secure any loose ends. 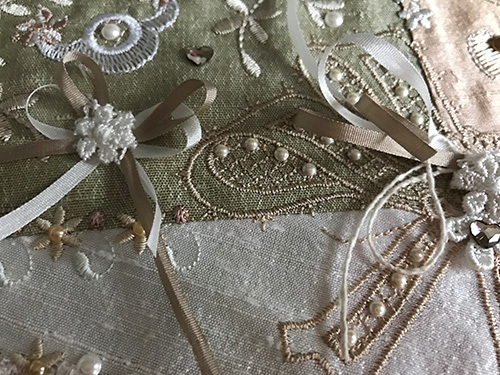 When using lace look at it closely as the side that shines is the correct side to use. The petals of the tiny hibiscus flowers shown below were stitched in two colours which were not close enough in shade and have a slight harlequin look to them which I don’t like. I would try next time to make them closer shades or stitch them with the same thread. Lastly I thought I would throw out a challenge. 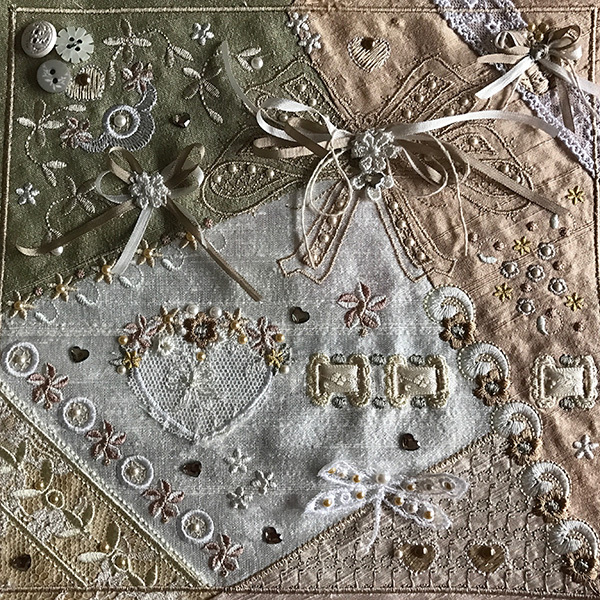 Have you considered making a quilt with all my Romantic Crazy Quilt blocks? You would need to change the colours so that they all followed the same colour scheme but I envision remarkable results. 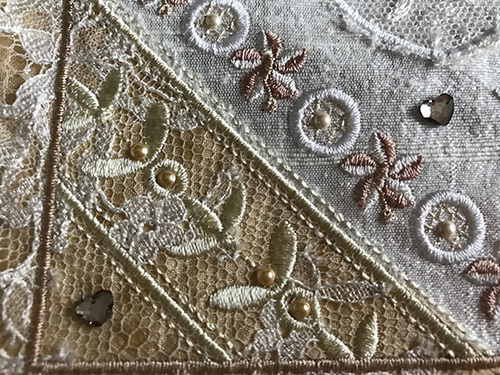 This entry was posted in Discussing machine embroidery, New Designs and tagged Crazy quilting, Crystals, Embellishment, embroidery on silk, Planning colour schemes, The importance of colour. Bookmark the permalink. This is so beautiful–it almost brings me to tears. Hazel, your work leaves me speechless, it is so gorgeous! I look at it and wonder if I can even come close. Congrats on another beautiful creation. How SPECTACULAR your work is!! 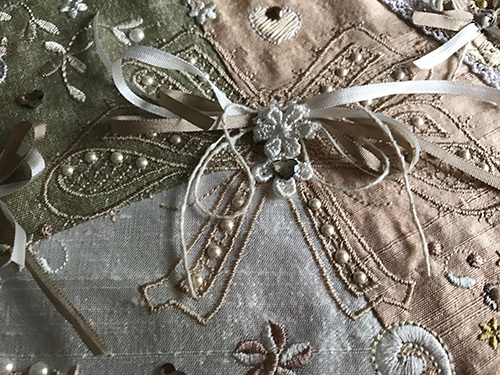 It is so ‘heirloom’ it looks like it belongs in the era of several hundred years ago when women spent hours and hours each day doing handiwork. 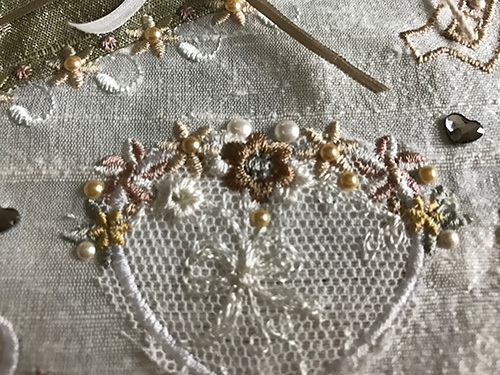 What a treasure for generations to come can be created with your embroideries! Thank you so much for your kind comments. I had such fun with this and hope you all do when I release it. Well this is just beautiful. Love your work – so stunning.